In this review, you can learn more about FungiCure Anti-Fungal Liquid Gel. This product is a substance designed to relieve any of the uncomfortable symptoms that come with fungal infections, such as rashes, irritation, the cracking and chafing of skin, burning and general discomfort. FungiCure Anti-Fungal Liquid Gel also cures fungal infections entirely, eliminating the spores which cause afflictions such as athlete’s foot, jock itch and ringworm. To find out more about FungiCure Anti-Fungal Liquid Gel, continue reading this review. FungiCure Anti-Fungal Liquid Gel’s key active ingredient is Undecylenic Acid. This substance generally appears as a secondary active ingredient in many anti-fungal products, and its presence as the only active ingredient has us confused. Undecylenic Acid has its uses against fungus, however it is significantly less effective than most others similar substances. Typical anti-fungal substances attack the fungal cell membrane, however Undecylenic Acid prevents the formation of Hyphae, which is the infectious incarnation of the fungal spores. This tactic is much less fruitful than the method of attacking the membrane. The inclusion of Aloe Vera, on the other hand, is a smart move, as it prevents the typical side effects of extreme stinging when any substance is applied to the skin that has become infected by tinea cruris, resulting in jock itch. This is where the differences between this and other anti-fungal agents end. The application of FungiCure Anti-Fungal Liquid Gel is as simple as it gets. You need to thoroughly wash the target area, and dry it before the application of the gel. Once this step is complete, you should rub a thin layer of the gel into your skin, as to allow it to clean the pores as well as the skin’s surface. It is recommended to apply the product at least twice a day. 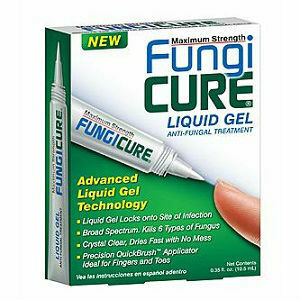 If you are using FungiCure Anti-Fungal Liquid Gel to treat an on-going infection, use it for four weeks. If you see no progress, visit a doctor. Though extremely rare, FungiCure Anti-Fungal Liquid Gel has been known to cause side effects which are virtually identical to the symptoms of fungal infection, however the same can be said of other similar fungus treatment products. Some people are allergic to anti-fungal ingredients, and coming into contact with Undecylenic Acid will cause the skin to crack and burn, resulting in irritation. Buying a single 0.35 ounce tube from Amazon will cost you $6.99, with free shipping if your purchase is over $35. There is an option for a monthly subscription, where the price is reduced to $5.94, but this is still extremely expensive. The manufacturer offers no form of a money-back guarantee, and the customer reviews are mixed. FungiCure Anti-Fungal Liquid Gel is an effective product with a low risk of side effects and comes with simple application instructions. However, the quaint choice of ingredients and the considerably high price, coupled with the lack of a guarantee urge caution. Jimmy Rodriguez	reviewed FungiCure Anti-Fungal Liquid Gel	on June 10th	 and gave it a rating of 2.5.